The Daughter and I have been busy doing nothing this week in Cancún, which, as you may have read, I am really good at doing. This is not our first visit here, and we were looking for a relaxing trip to end a period of turmoil. We could have gone to one of the Delmarva beaches, significantly closer to home, but, oddly, it’s cheaper to come to Mexico, even with the cost of airfare or frequent flyer miles. I was first here in the fall of 1984 with the Veterinarian. We were on a badly-needed vacation, the first we had in 12 years of marriage that didn’t include family or friends and the first of any kind in over three years. Fearing the cost of hiring a relief veterinarian and potentially losing clients, he didn’t want to take time off. I pointed out it was them or me, which was a great incentive. I put him in charge of the plans. At the time, Cancún was underdeveloped and an exotic destination, long before it became a haven for spring breakers and wet t-shirt contests. Touted by a travel agent as an “American-quality” resort destination (i.e., the water was potable), its major appeal was and is the wide white sand beach and the bargains on lodging and food. We stayed at the Sheraton Cancún, which, the travel agent told us somewhat apologetically, was far from town, surrounded by marshland. It sounded great to us. The most exhausted people on Earth, we didn’t care to partake in the nightlife. That’s right; we’d be making conversation with one another 24/7. As our plane landed at the small airport, we noticed numerous vintage airplanes scuttled off to the sides of the landing strip, including several DC-3s that appeared to have crashed into the jungle. The Sheraton’s main building was low-slung, suggesting traditional pyramids, and the outbuildings were finished with traditional thatched roofs. Interiors were finished with stucco and bright terra cotta tiles. It was casual but sedate and had so many amenities that we didn’t even need to leave the resort. 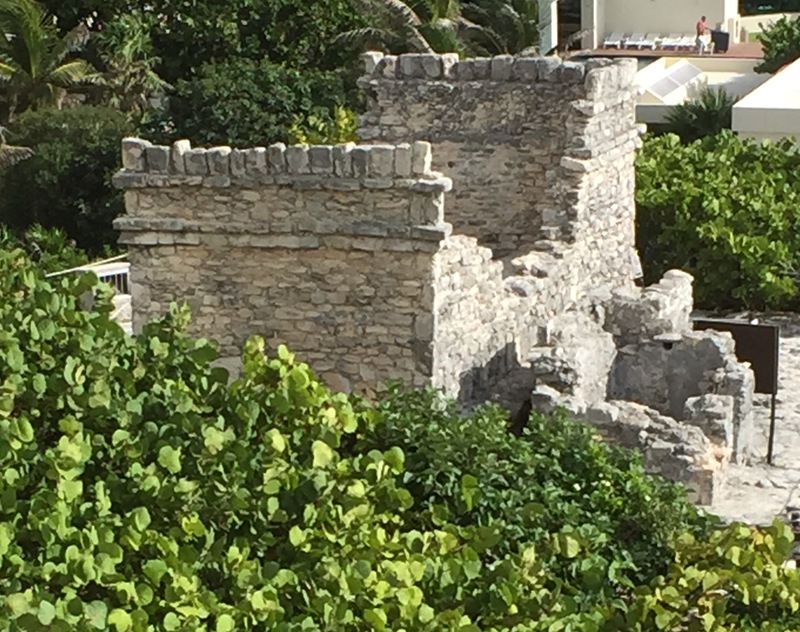 The concierge who welcomed us pointed out the swim-up bar and even a small Mayan ruin, consisting of two buildings that may have been used as watchtowers along the coast. The hotel restaurant’s food was a nightly buffet of Mexican specialties from various regions, so, everything was at our fingertips. The resting and healing began. On our last night, we succumbed to the concierge’s repeated recommendation of the “traditional” fiesta dinner at a restaurant “downtown” that was included in our vacation package. We took a taxi into town, and, while I don’t recall the name of the restaurant, it was a meal made memorable by the floor show of our waiter and not by the food. As he delivered a pitcher of watered-down Margaritas, our waiter began a rapid-fire inquiry into our hometown, what we had seen since our arrival, etc. We sat back and sipped at the drinks and perused the limited menu options. In a few minutes, he returned to take our order. When he left, I leaned across the table to the Veterinarian. The waiter returned with guacamole, salsa and chips and iridescent eyeshadow on his lids. I’ve been in the theatre for 95% of my life, so I remained unfazed. “Huh,” I commented, “he must be part of the show.” We dug into the chips, the best part of the meal, and enjoyed the strolling mariachi. Fifteen minutes later, our entrées arrived, over-salted, touristy-bland, and swimming in melted cheese. Oh! And our waiter was wearing heels, fishnets, a spiked black wig, and one false eyelash. I had to quickly look away because I was on the verge of losing my composure. No such luck. And, yes. It turned out to be a drag show, with the only sombreros on the heads of the heterosexual norteamericanos in the audience. Our waiter lip-synched to Liza Minelli doing “New York, New York.” When he brought us our flan and cafés méxicanos, we thanked him for a night we would never forget. Just then, there was an explosion outside the open window against which I was leaning. The fiesta’s grand finale began with fireworks, pinwheels spewing colorful sparks in every direction and clouds of smoke drifting through the window into the restaurant. “We paid in advance, right?” The Veterinarian shouted over the noise. Between the smoke and my laughter, tears were rolling down my face, so all I could do was nod wildly. “Then we need to get the hell out of here before the place goes up in flames.” He dropped a generous pile of pesos on the table for our waiter and headed for the door. So much for the traditional fiesta. The next day, we arrived at the airport early and checked-in for our Mexicana airlines flight to Philadelphia. We cleared customs and stood in the small waiting room, where all the seats were taken. We looked at each other and couldn’t move fast enough, locating a man in a Mexicana Air uniform who assisted us through customs, where other passengers were trying to get out. “We were here first,” a blond woman snarled. “I’m sorry,” the airline’s agent said, “but these people were the first to contact an airline official, as instructed.” He expedited our return through customs and to the ticket counter, where we were re-booked on a flight that left for Dallas two hours later and handed — are you sitting down, because you aren’t going to believe this one — 1,500 US dollars. I am not kidding you. The agent took us back through customs, where we sat in a trance. “How much did this week-long vacation cost us?” I asked. And that is how a trip to Cancún saved our marriage. Alas, we never did get back. There was always something else to see. Something else to do. Until 2012. 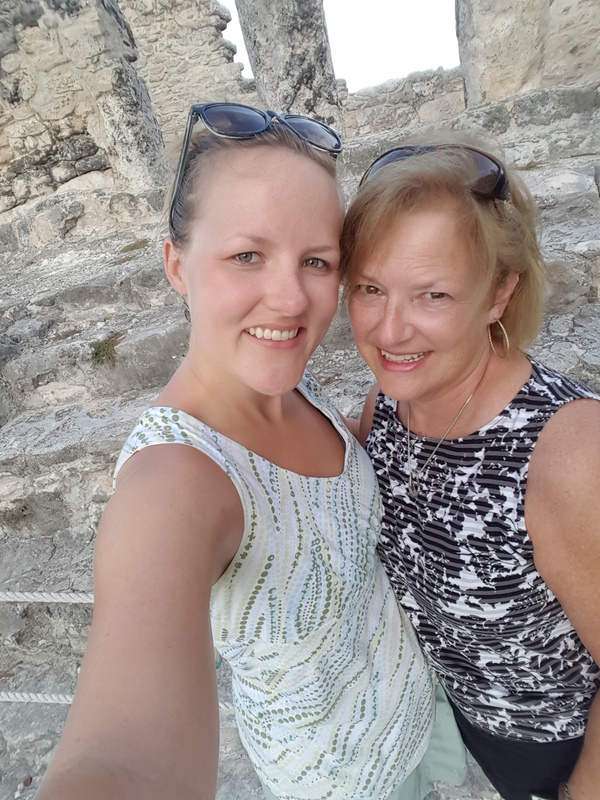 Seven months after the Veterinarian left us, the Daughter and I returned to Cancún, seeking rest. A search on the internet found us an unbelievable deal on a one bedroom “villa” at the Westin Cancún. I hired a service to pick us up at the airport. Much had changed since 1984. Although the airport was huge and modern, one of the DC-3s was still laying sadly on its belly next to the runway. Our driver pointed out all the sights on our way to our hotel. I didn’t recognize a single thing. I told him about staying at the Sheraton on our previous trip. He was too young to remember it. But, in the back of my brain, something seemed familiar. We pulled up to the guardhouse of the sprawling, modern resort, where the guard checked our names on his list and waved us through. At the top of a ramp, massive glass doors slid open, and we walked into the lobby. Through the glass wall on the other side, I saw the pool and a thatched, swim-up bar. “And is there a Mayan ruin on the premises?” I still wasn’t sure it was the same spot. I couldn’t believe it. 28 years later, of all the hotels in all of Cancún, we were in the same place. We had a wonderful, relaxing time. 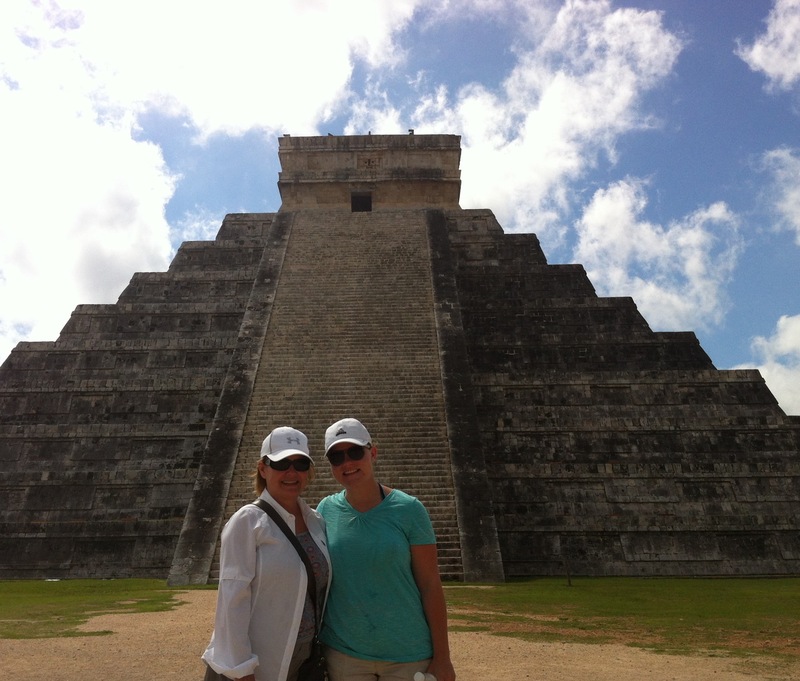 I hired a private guide for tours of Tu’lum and Chichén Itzá. He told us wonderful stories about what we were going to see, and the driver was waiting for us with wet chilled facecloths and bottles of cold water when we limped back to our van. He told me how lucky I was to have been able to see the now-inaccessible parts and how other tourists and local vandals had damaged them. 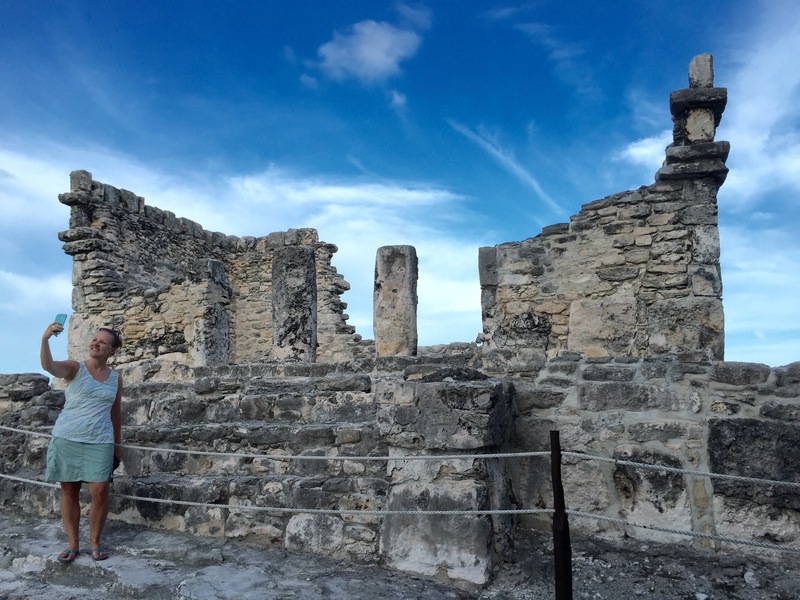 I thought about the many traces of the Maya that have disappeared in the hotel zone and about the ruins on the property with new respect. Now, we are back and headed to the ruins of the ancient watchtowers before dinner. They sit on the highest point of land on the shore, facing the sea, still watching. Yesterday, a Mexican naval patrol boat cruised up and down the shore until well after dark. The more things change, the more they remain the same. The turtles still nest. We still find rest. The hamburgers remain the best. So, who am I to complain? Life is good (mostly). Soli Deo Gloria!